Channel Sakura or Japanese Culture Channel Sakura (日本文化チャンネル桜) is a conservative television production company and internet station founded in 2004 to “restore traditional Japanese culture and Japanese national soul.” President and Director Satoru Mizushima founded Channel Sakura along with Shiro Takahashi, Yoshiko Matsuura, and others. Current and former personalities for Channel Sakura include, in addition to Mizushima, Miki Otaka, Mio Sugita, Kohyu Nishimura, Shigeharu Aoyama, Koichi Sugiyama, Genki Fujii, Yoshiko Matsuura, and others. JAPAN Forward is an English language news and opinion site operated by Sankei Shimbun through JAPAN Forward Association Inc. (一般社団法人ジャパンフォワード推進機構). It publishes articles translated from Sankei’s Japanese publications, including Sankei Shimbun and Seiron, including many on issues of history and national security. Japan Forward solicits membership dues from its “supporters” which range from 10,000 yen (about US$100) to 1,000,000 yen (about US$10,000) annually. JAPANISM (ジャパニズム) is a bimonthly magazine published by Seirindo. Founded by conservative journalist Kohyu Nishimura, JAPANISM prominently features writings of far-right nationalist commentators, many of whom are comfort women deniers. JAPANISM is home to the right-wing manga (comic series) Hinomaru Gaisen Otome (日之丸街宣女子) by Akiko Tomita (富田安紀子) which glorifies anti-Korean hate groups and propagates a thoroughly debunked claim that the establishment of a comfort women memorial in Glendale, California have led to widespread bullying against Japanese children. Recent contributors to JAPANISM include Toshiko Hasumi, Shunichi Fujiki, Mio Sugita, Mitsuhiko Fujii, Makoto Sakurai, and others. Kazuyoshi Hanada (花田紀凱) is a right-wing magazine editor and comfort women denier. He has been the editor-in-chief of several magazines, most recently for the right-wing WiLL (2004-2016) and Monthly Hanada (2016-). In 1995 Hanada was the editor-in-chief of Marco Polo, a monthly men’s magazine, which published an article disputing the existence of gas chambers at Nazi concentration camps. After international criticisms, he was fired and the magazine was discontinued. In 2006 as the editor-in-chief of WiLL, Hanada wrote an internet rumor about the former leader of the Social Democratic Party being a Korean as a fact. The court determined the article to be an obvious falsehood and ordered Hanada to pay compensation. Hanada was a co-singer to Channel Sakura’s letter protesting the U.S. H.Res.121 demanding Japan to “accept historical responsibility” for the treatment of comfort women. Sankei Shimbun (産経新聞) is a daily newspaper in Japan with a distinct conservative and nationalistic slant. In 2015, Sankei had the seventh largest circulation after three major newspapers (Yomiuri, Asahi, and Mainichi) as well as some regional and specialized newspapers. Sankei Shimbun also publishes Seiron (正論), a monthly conservative opinion magazine, and Yukan Fuji (夕刊フジ), an evening daily. 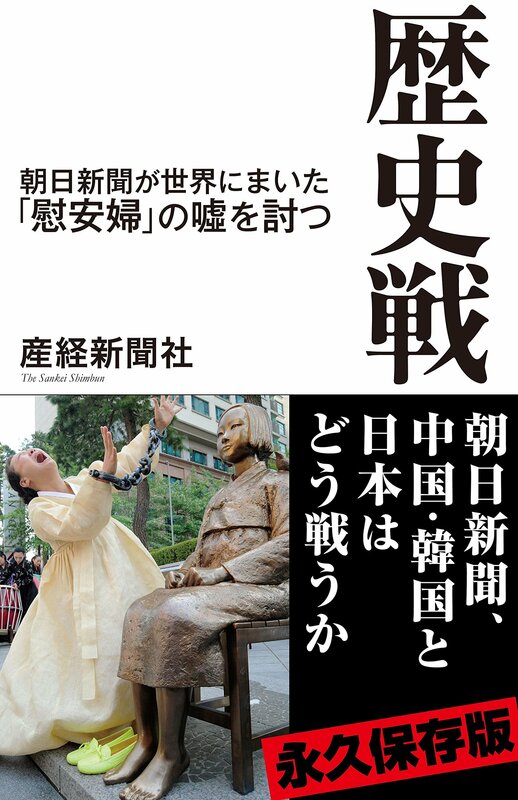 Since April 2014, Sankei Shimbun began publishing a series of columns titled “History Wars” (歴史戦) that are aimed at overturning historical orthodoxy of Japan’s war crimes during the WWII, especially the comfort women system and the Nanking atrocities. Authors for the series include Yoshihisa Komori (古森義久), the newspaper’s Washington D.C. correspondent and a member of the editorial board; Rui Abiru (阿比留瑠比), the politics editor and a member of the editorial board; Takashi Arimoto (有元隆志), the politics editor; Katsushi Nakamura (中村将), the Los Angeles correspondent; and others. 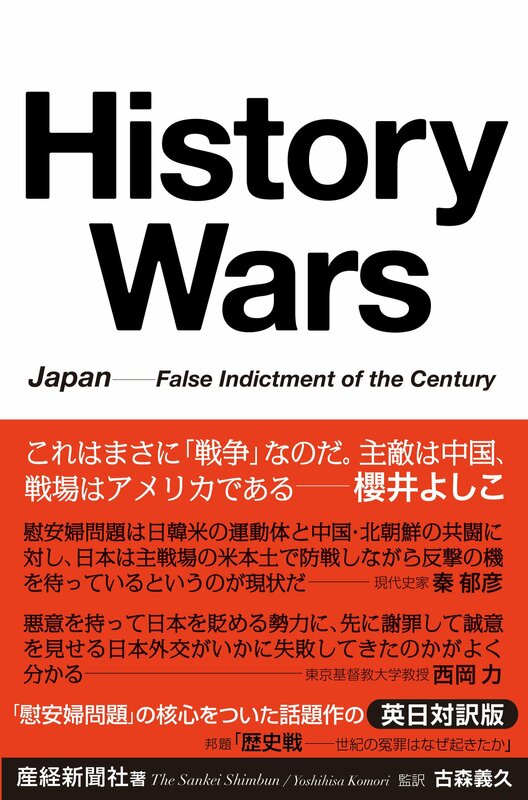 Some of the early columns in the series were compiled and published in October 2014 as the book “History Wars,” which was then translated into English as “History Wars: Japan–False Indictment of the Century” in July 2015. It was one of the two books Parliament member Kuniko Inoguchi sent unsolicited to hundreds of foreign researchers and journalists covering Japan. 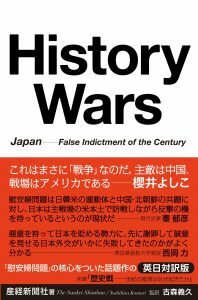 In addition to columns written by members of its own editorial team, Sankei Shimbun and Yukan Fuji publishes columns by noted history deniers including Koichi Mera, Tony Marano, Mio Sugita, Yumiko Yamamoto, and others. At least on one occasion, Sankei Shimbun formally sponsored a fundraising event for the Global Alliance for Historical Truth. In 2017 Sankei Shimbun launched an English language news site Japan Forward, which publishes opinion pieces written by Michael Yon and other comfort women deniers. Satoru Mizushima (水島総) is the founding president/director of right-wing television production company and internet station Channel Sakura and a comfort women denier. In 2007, he spearheaded a protest letter against the U.S. House of Representatives for adapting H.Res.121 calling on Japan to formally acknowledge responsibility for the military comfort women system during the WWII. 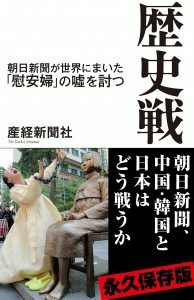 He signed on the letter as the director of the Japanese Citizens’ National Movement for the Historic Truth about the Comfort Women Issue (慰安婦問題の歴史的真実を求める日本国民運動の会), along with its affiliated groups. Mizushima also signed onto an opinion ad by Committee for Historical Facts, Yes, we remember the facts. (2012) which was published in The Star-Ledger (New Jersey) in November 2012.